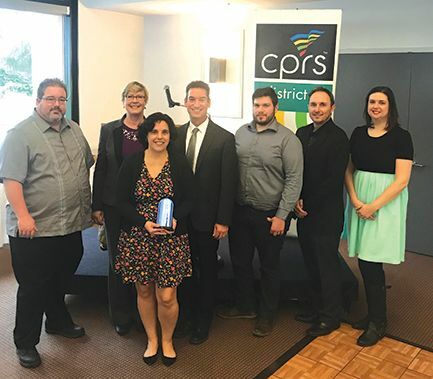 RANCHO CORDOVA, CA (MPG) - Cordova Recreation & Park District (CRPD) recently accepted an Excellence in Design award from the California Park and Recreation Society (District 2) for the fitness course addition to Lincoln Village Community Park. Adding to the theme of physical health, CRPD is excited to start offering the Walk With Ease program to the community at Lincoln Village Community Park beginning April 1, thanks to an instructor training grant from the National Recreation and Park Association and the Centers for Disease Control and Prevention. They received the award on March 7, 2019. While CRPD's programs have long been centers of health and wellness in the community, parks and facilities had yet to offer a free workout environment. After the Lincoln Village Community Park walking paths were upgraded last year, the Neil Orchard Senior Activities Center members expressed an interest in “gym-quality” equipment to supplement the District’s aerobic offerings. Inspired by neighboring parks and recreation agencies and their residents, CRPD launched the Outdoor Fitness Course Project a multi-agency, non-profit partnership between the Cordova Recreation and Park District, the City of Rancho Cordova, and the Neil Orchard Senior Activities Center Advisory Board. CRPD Park Planner Cristina James, the project lead, spoke to the growing popularity with outdoor fitness courses and how the course will benefit the community. “Research shows that working out in nature and sunlight triggers chemicals in your brain that help you sleep better! After we’d heard from residents and read about mental and physical health benefits like that, we were convinced that providing a fitness course was exactly what the community needed,” Cristina said. Beyond the health benefits, the District felt that outdoor fitness courses also provide a welcoming social environment, different than that of a traditional gym. “Having fitness equipment outside makes it feel like an adult playground in some ways. We were able to transition empty space into shared, endorphins-producing space that fosters social connection in both the older and younger generations,” Cristina said. For this project to become a reality, CRPD relied on public outreach to shape the design of the accessible, state-of-the-art, 5-piece course, and funding from the City of Rancho Cordova’s Community Enhancement Fund. With a matching amount and in-kind labor provided by CRPD, the Lincoln Village Community Park fitness course came to life and is now able to provide an environment for thousands of residents to engage in an active lifestyle. Beyond the course, CRPD’s new Walk with Ease (WWE) program, developed by the Arthritis Foundation, will contribute to increasing activity in community members daily routine. Studies by the Thurston Arthritis Research Center and the Institute on Aging at the University of North Carolina have shown that WWE helps reduce pain and stiffness associated with arthritis, offers benefits for people managing other chronic conditions, contributes to reduced pain, increased balance and strength, increased levels of physical activity, and improved overall health. “Walking can offer numerous health benefits to people of all ages and fitness levels. It may also help prevent certain diseases and even prolong your life. This grant from NRPA and the CDC allows us to add a new way for community residents to fulfill daily recommended exercise, and all you need to start is a sturdy pair of walking shoes,” District Administrator Patrick Larkin said. As one of only 40 park and recreation agencies across the country to be awarded the WWE instructor training grant, CRPD’s fitness instructors will receive grant-funded training so they may offer the best level of service to the community. “We are extremely grateful to be the recipient of the WWE grant because it allows us to continue to help our community keep fit in mind, body and spirit,” Heather Schelske, Recreation Supervisor at the Neil Orchard Senior Activities Center, said. The Walk with Ease program will be offered three times per week for six weeks by certified and trained instructors. The classes are ideally suited for seniors 50+ who are interested in a low-impact exercise program in their local community, especially those looking to manage a chronic condition. The program is scheduled to begin Monday, April 1 at 10:30 a.m. For more information, visit crpd.com/programs/active-senior. About CRPD: Cordova Recreation & Park District is one of the largest independent special districts in Northern California serving over 120,000 residents and four school districts in the greater Sacramento area. CRPD provides over 40 parks and recreational facilities, as well as youth & adult sports, camps, enrichment classes, educational programs and special events for the community. California Park and Recreation Society is a membership organization with just over 4,000 members representing the 535 local parks and recreation agencies throughout the state. The mission of CPRS is to advance the profession and its members through education, networking, resources, and advocacy. Learn more at www.cprs.org. The National Recreation and Park Association is a national not-for-profit organization dedicated to advancing park, recreation and conservation efforts that enhance quality of life for all people. Through its network of more than 60,000 recreation and park professionals and citizens, NRPA encourages the promotion of healthy and active lifestyles, conservation initiatives and equitable access to parks and public space. For more information, visit www.nrpa.org. For digital access to NRPA’s flagship publication, Parks & Recreation, visit www.parksandrecreation.org.